TracFone's Simple Mobile has doubled the amount of high-speed data included with its two top plans from 5GB to 10GB. 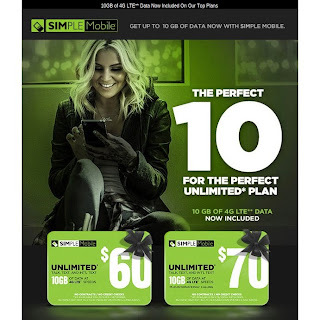 The $60 Unlimited Plan now includes unlimited talk. text (including international) and data with the first 10GB at high speed and the rest throttled to an unspecified speed. 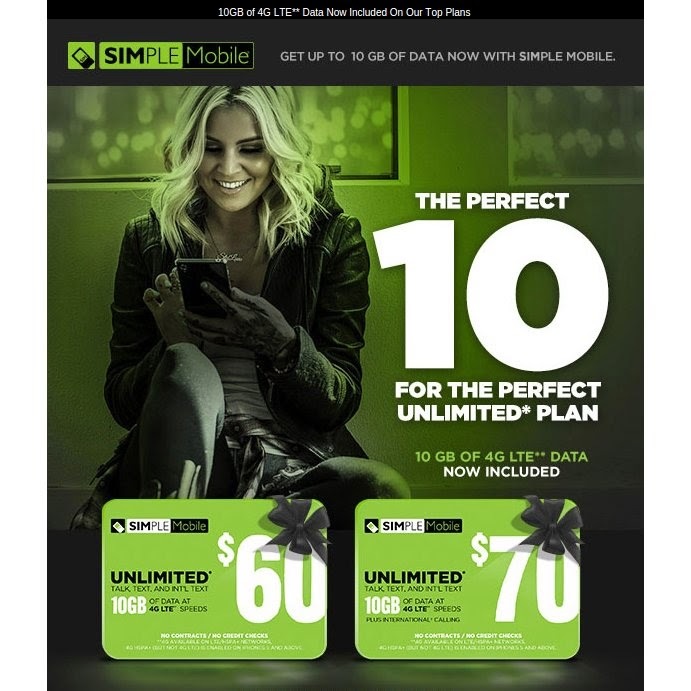 The $70 Unlimited International Plan includes the features of the $60 Unlimited Plan plus unlimited international calls to up to 10 unique numbers in 51 countries (covered countries). Simple Mobile uses the T-Mobile native network with no roaming. High-speed data includes LTE. Not to belabor T-MOBILE coverage issues, but no roaming of any kinds seems rather harsh. If you need coverage, then T-Mobile is not for you. For many people, native T-Mobile network is sufficient and therefore represents a great value. 1. T-Mobile covers 96% of US residents, more than 301M people, when you include the free roaming. 2. T-Mobile native network covers more than 285M US residents. 3. T-Mobile now has 260M people covered with LTE, ahead of schedule. 4. T-Mobile has deployed Band 12, 700 Mhz spectrum in Long Island and Houston, and sells a few devices to support Band 12. Sure, a lot of people live within the coverage area, but to me that is irrelevant. I need a phone that works when I am not at home where I have wifi. I find the POP numbers totally misleading. I need a phone that works when I have a flat tire in the middle of nowhere or when on vacation visiting the mountains. When I am at home or at work I have multiple means of communication, but when I am away from those places I don't and that's when I need the phone the most. Free roaming on AT&T and other regional carriers covers a LOT of mountains and other rural areas. In the middle of nowhere, a SPOT Satcom Module for your smartphone is the only way to guarantee service. According to information its 17th "Mobile Wireless Competition Report," the FCC's Wireless Telecommunications Bureau says 97% of Americans can choose from at least three different major carriers. So, only about 3% of Americans have to pay extra for service in their area with Verizon or AT&T. So their plans now include 1GB, 3GB or 10GB of data. Does this seem odd to anyone? Just like cricket and the others. I don't understand why anyone would want this plan over Metro PCS 60 dollar unlimited plan that has zero throttle. Good point. But MetroPCS isn't available everywhere for some reason. Metro pcs uses the Same network as simple mobile, so Why have a cap when you don't have to? Not exactly the same seeing as Metro includes voice/text At&t roaming. That is why Metro would be a better choice than native T-mo network Simple Mobile only. It can be used for internal calls ? If you mean international calls, Simple Mobile supports international calls and has fairly low international calling rates. Check the Simple Mobile site for details.